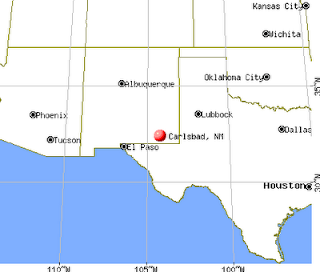 Carlsbad, New Mexico is a YIMBY (Yes In My Back Yard) city when it comes to storing nuclear waste. This vibrant city of 25,000 would love to replace Yucca Mountain as the nation's repository for high level nuclear waste. 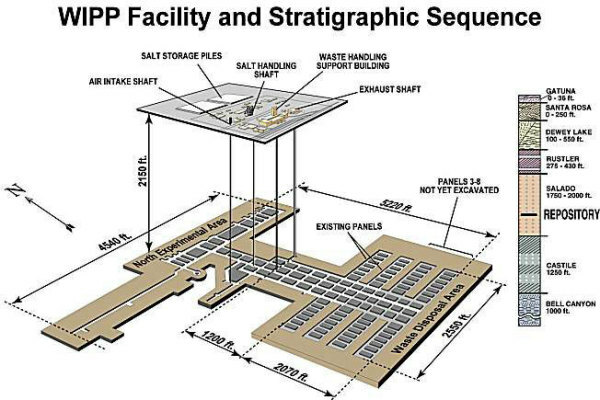 The Waste Isolation Pilot Project (WIPP) already accepts low level nuclear waste. 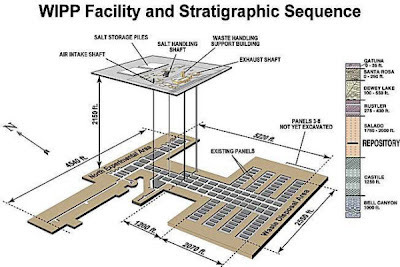 WIPP is the nation’s only permanent, deep geologic repository for nuclear waste. The Nuclear Waste Fund has already collected about $30 billion from the ratepayers of nuclear reactor owners for a national repository. Carlsbad wants this money. Thanks to WIPP, unemployment sits at 3.8%, versus 6.5% statewide and 8.5% nationally. Also, New Mexico has received more than $300 million in federal highway funds in the past decade, $100 million of which has gone into the roads around Carlsbad. The roads have to be good for the two dozen trucks a week hauling in radioactive drums brimming with the plutonium-laden detritus of America’s nuclear weapons production. The Department of Energy’s $6 billion program created 1,300 permanent jobs, many of them high-paid engineering positions. Energy’s annual budget for WIPP is $215 million, much of which stays in the community as wages. The leaders of neighboring Lea and Eddy counties have established a 1,000-acre atomic industrial park. On June 23, 2006, Louisiana Energy Services (LES) was issued a license to construct and operate a $3 billion gas centrifuge uranium enrichment/fabrication plant to be known as the URENCO USA facility, located five miles east of Eunice, New Mexico. The Energy Department’s budget for the project has fallen in recent years from $250 million to $215 million; last year WIPP contractors shed 130 workers; those who remain are handling fewer shipments and less waste than before. Since opening in 1999, WIPP has operated so smoothly and safely that Carlsbad is lobbying the feds to ­expand the project to take the nuclear mother lode: 160,000 more tons of the worst high-level nuclear waste in the country—things like the half-melted reactor core of Three Mile Island and old nuclear fuel rods—that are residing at aging nuke plants. Though taxpayers have already spent some $12 billion mining out and engineering Yucca Mountain, 90 miles from Las Vegas, power brokers in Nevada fought the congressionally approved project from the get-go. Bowing to Nimby—and Nevada’s powerful Senator Harry Reid—two years ago President Barack Obama’s Administration declared Yucca DOA. Contractors have since laid off some 1,000 workers there. On Mar. 26, 1999 the townsfolk of Carlsbad gathered to cheer the first truck to deliver waste to WIPP. New Mexico, in agreeing to WIPP, required that Congress enshrine in law a promise that the feds would not send high-level waste into the state. WIPP won’t be the next Yucca unless that issue is wrangled, and reversed, by Albuquerque and Washington, DC. Carlsbad has perfect geology for the waste because it sits atop the biggest salt deposit in America, stretching from New Mexico clear to Kansas. The 3,000-foot salt layer is the thickest in the country, is nearly impervious to seismic activity, quickly heals any cracks or faults and remains completely impermeable, with no way for any water to get in or for any radiation to escape. The waste drums’ final resting place is down an elevator 2,150 feet into the salt. WIPP’s tunnels and rooms have 15-foot ceilings, enough to stack drums three high. So far it’s swallowed 10,200 shipments totaling 200,000 tons impregnated with 5 tons of plutonium. To get that stuff to WIPP drivers have logged 12 million miles with loaded trucks and 10 million miles empty. Low-level waste (LLW) is nuclear waste that does not fit into the categorical definitions for interemediate-level waste (ILW), high-level (HLW), spent nuclear nuclear fuel (SNF), transuranic waste (TRU), or certain byproduct materials known as 11e(2) wastes, such as uranium mill talings. In essence, it is a definition by exclusion, and LLW is that category of radioactive wastes that do not fit into the other categories. While the bulk of LLW is not highly radioactive, the definition of LLW does not include references to its activity, and some LLW may be quite radioactive, as in the case of radioactive sources used in industry and medicine. High level waste (HLW) is very radioactive and contains many of the fission products and transuranic elements generated in the reactor core. HLW accounts for over 95% of the total radioactivity produced in the nuclear power process. In other words, while most nuclear waste is low-level and intermediate-level waste, such as protective clothing and equipment that have been contaminated with radiation, the majority of the radioactivity produced from the nuclear power generation process becomes high-level waste. High level waste is very radioactive and, therefore, requires special shielding during handling and transport. It also needs cooling, because it generates a great deal of heat. Most of the heat, for the first several hundred years, is from the fission products cesium-137 and strontium-90.